Members of the curatorial collective examining a gallery display. Every artwork tells a story. Some stories we know by heart, while others introduce us to something we may not have heard before. 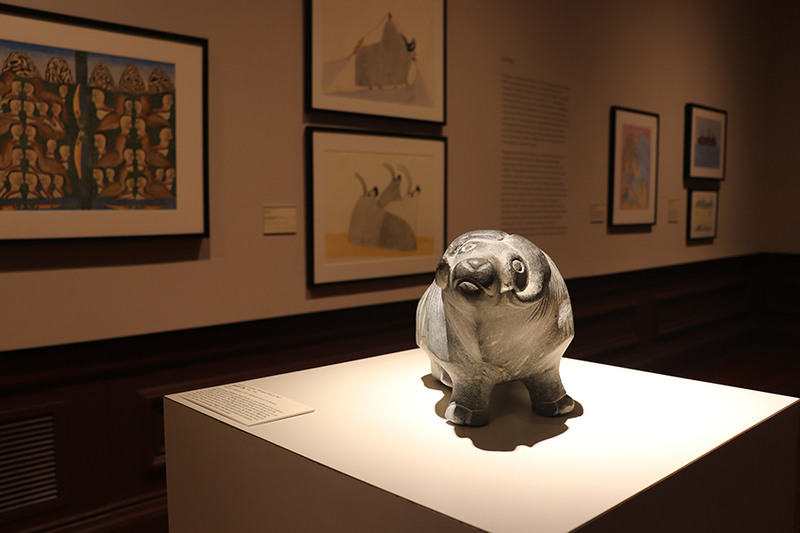 The 20th- and 21st-century Inuit and Yup’ik drawings, sculptures, baskets, carvings and handmade dolls in the permanent Museums Collections tell stories and demonstrate values of cultures that may be unfamiliar to some audiences. During the Spring 2018 semester, eight students in an art history graduate seminar did more than just study these objects and artworks. They dove deep into the cultures, the history and the timeline to understand and appreciate the values these materials demonstrate and the impact they have. Armed with that knowledge, they created a way for us all to engage with and access these works—and the stories and cultures they preserve. How did this class of eight, known as the “curatorial collective,” do that? They created “The World Is Following Its People”: Indigenous Art and Arctic Ecology, an exhibition on view through December 7, 2018, in Old College Gallery. To curate the exhibition and present the material in a way that reflected the nuances of the cultures, they conducted extensive primary research. Only some of the materials have had scholarship published on them. But that didn’t stop the curatorial collective. Instead, it provided an opportunity for them to create original research and share important discoveries about the art and objects. They sought out Indigenous scholarship, interviewed prominent scholars in the field, reviewed anthropological studies and got hands-on experience working with the collection. Wray, as part of the curatorial collective, was responsible for selecting drawings and prints that engaged with the idea of sustenance. As a result of this focus, she produced multi-layered research on the drawing “Hungry Dogs in Camp” by Inuk artist Qaunaq Mikkigak. To dig deep into the drawing, Wray first had to understand the history. In the 1950s, Inuit of northern Canada experienced drastic changes to their day-to-day lives. The fur trade collapsed, residential schools were established and made mandatory for Inuit children, and new hunting restrictions hampered the Inuit community’s ability to make a livelihood. The Canadian government also introduced assimilation policies that pressured Inuit to move into permanent settlements, as opposed to their semi-nomadic lifestyles, and participate in a wage economy. These disruptions to life as they knew it led Inuit to creating art both as a source of income and as a means of preserving their culture and environmental knowledge in the face of changing times. In the drawing, two Inuit hunters are constructing an igloo while their qimmit, or sled dogs, run towards a walrus carcass. To understand how Mikkigak used this drawing to preserve Inuit culture, Wray needed to understand the nuances of Inuit culture and settler colonialism individually and in context with one another. But her research extends far beyond subject matter. Wray also took a keen interest in why the art was created in the first place: income. In the process of their research, the students relied on one another’s expertise as well. Members from the curatorial collective who are part of Winterthur’s Material Culture program, including Sara McNamara and Elizabeth Humphrey, provided insight that bolstered understanding of objects including Yup’ik baskets, dolls and tools. Zoe Weldon-Yochim, a student with an interest in eco-criticism, provided her classmates with insight on how the objects and artwork speak to the environment, whether it be through subject matter or the materials used to create the art. Penn doctoral student Ramey Mize, who had helped curate an exhibition in a previous curatorial seminar, shared her logistical knowledge to inform and set up the show. From selecting which objects would be on display out of the hundreds in the collection to writing label text, from deciding on themes to designing a floor plan, the curatorial collective shaped every aspect of the exhibition. To ensure the curatorial collective’s vision came to life, Wray interned with the UD Library, Museums and Press this summer. There, she was essential to the Museums team as they installed the exhibition. She provided supplemental research for the objects and artwork, handled copyright requests on the artwork, helped design maps of the areas Inuit and Yup’ik communities call home, helped with the physical installation of the pieces, and created the accompanying exhibition website. 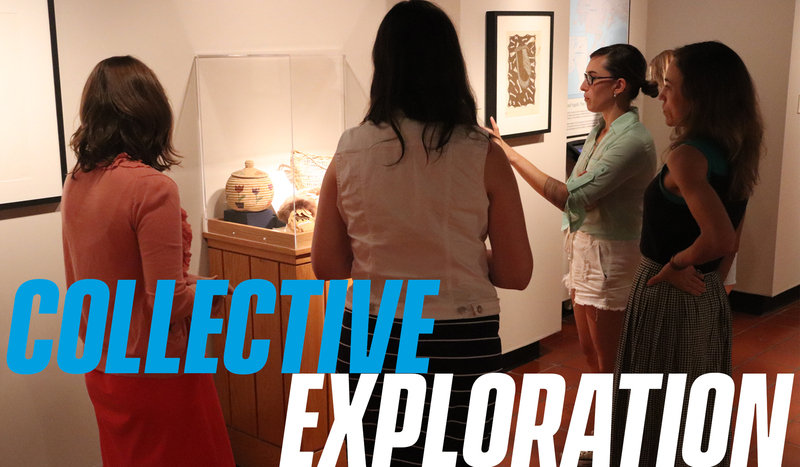 Along every step of the process, Wray and her fellow curatorial collective members learned practical research skills and approaches to art history that they can use throughout their careers. 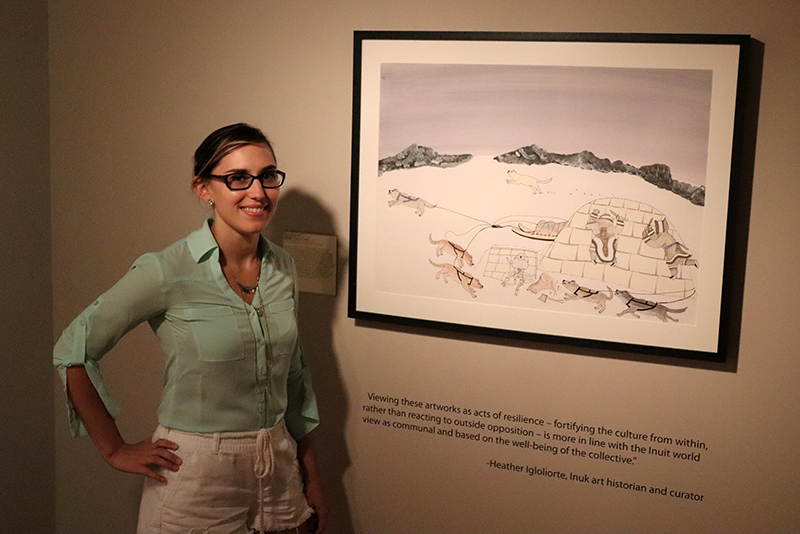 Just a year into her program, she has co-curated an exhibition, worked directly with objects in a rare and extensive collection of Native American art, and been selected to present her original research during a symposium on “New Perspectives in Native American Art and Museum Studies” at the University of Oklahoma. While she’s excited by the opportunities to share her research among scholars and peers, her experience with the curatorial collective further inspired her interests in making art accessible to all. Artwork on view in Old College Gallery. Stop by Old College Gallery to view the curatorial collective’s exhibition, “The World Is Following Its People”: Indigenous Art and Arctic Ecology, through December 7, 2018, to explore the nuances of Inuit and Yup’ik cultures and their relationships with the environment through art. To get an even closer look into the curatorial collective’s research, join them for the exhibition reception on September 26 and gallery talks throughout the semester, including Wray’s gallery talk on “The Politics of Hunting in the Arctic” on September 20 at 12:15 p.m. The members of the curatorial collective are Meghan Angelos, Elizabeth Humphrey, Sara McNamara, Ramey Mize, Victoria Sunnergren, Rebeccah Swerdlow, Zoe Weldon-Yochim and Zoë Wray. They worked alongside Dr. Jessica Horton, assistant professor of art history, as faculty advisor, as well as Library, Museums and Press staff, with the Frederick and Lucy S. Herman and the Mabel and Harley McKeague collections of Inuit and Yup’ik art. News Mention: Banned Books Week Fea..